KIEV, Ukraine -- The United States has accused Russia-backed separatists in eastern Ukraine of a campaign of "violence and harassment" against international monitors aimed at preventing them from reporting truce violations. 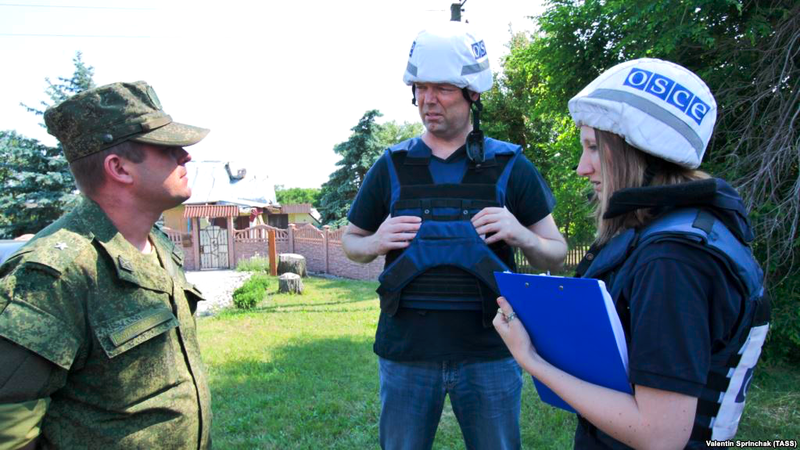 OSCE monitors visit the village of Sakhanka in the Donetsk region of Ukraine this month. U.S. State Department spokeswoman Heather Nauert said on June 22 that Washington was "deeply concerned" about the situation, describing the separatists as "Russian-led, Russian-funded, and Russian-trained." Nauert said that on June 20 separatist forces fired at retreating Organization for Security and Cooperation in Europe (OSCE) vehicles carrying monitors, and in April an American paramedic accompanying the monitors was killed when his truck hit an explosive. "The incidents are part of a broader effort to keep the international community from seeing what is happening in eastern Ukraine," she said. "We call on Russia to use its influence to end this campaign of intimidation and honor its commitment to allow free, full, and safe access to the OSCE monitors." A new cease-fire between Ukrainian troops and the separatists is due to come into effect on June 23. Previous truces in the conflict that has killed more than 10,000 people since April 2014 have broken down.